The Republican message is a strong one- the continued prosperity of Texas is due in large part to years of conservative governance. Low taxes, minimal regulation, and responsible spending have made Texas a great place to operate a business and raise a family. There is simply no comparison between the success of Texas when compared to states like Illinois and California, where liberal governance has driven business owners to flee burdensome regulation and sky-high taxes and set up shop in Texas. The 2018 election was unpleasant for Republicans across Texas, especially here in Harris County. Two seats in the Texas Senate and twelve seats in the Texas House fell to the Democrats, in addition to countless other judicial and local offices across the state. While these losses were certainly painful, the aftermath of the 2018 election cycle provides Republicans a unique opportunity to re-evaluate and regroup to strengthen and reenergize the party. This isn’t to say our government is perfect- no state is. Texas has challenges it must address and we should always look for ways to improve. Gov. Abbott, Lt. Gov. Patrick, Speaker Bonnen, and our Republican legislators have already taken great strides this session to work together to find conservative solutions to the public policy issues facing our state. I am confident that, with their leadership, we will have a successful legislative session focused on the issues of greatest concern to Texans. The 2018 election was not a repudiation of the values that make Texas strong, but it was a wakeup call that our messaging has not been effective. We must present our message in a way that makes conservative public policy relevant to the day to day lives of average Texas. After all, nobody has ever been taxed or regulated into prosperity. The core Republican principles of liberty and freedom, empowering individuals to make the most of their God-given talents and skills without the government getting in their way, is an inherently positive message. The blessings of liberty available in Texas are available to everybody, regardless of race or religion. We need “happy warriors” running for office up and down the ballot that can effectively communicate this positive conservative message. The coattails of Beto O’Rourke’s campaign resulted in the election of a number of Democrats to public office for no other reason than they happened to be in the right place at the right time. In many cases these Democratic candidates were never vetted, and their races received little attention. One such example is that of Jon Rosenthal, the newly elected State Representative for Texas House District 135, where I happen to reside. This district encompasses the Jersey Village, Cy-Fair, and Copperfield areas of Northwest Harris County. Representative Rosenthal was the founder of a local “Indivisible” group, which represents the far-left fringes of the Democratic Party. He filed to run for State Representative the afternoon of the filing deadline and was unopposed in the Democratic primary. On the website of Flippable, a liberal political organization which endorsed and contributed to Rosenthal’s campaign, Rosenthal expressed his support of a single-payer healthcare system. In his endorsement interview with the Houston Chronicle, Rosenthal proposed reforming school finance by legalizing and taxing marijuana and using the proceeds of the marijuana tax revenue to fund our public schools. Rosenthal also touted endorsements from other radical organizations that promote other far-left policy positions such as tuition-free public colleges and universities and abolishing ICE. The discussion about religion begins at approximately 46:00 into the interview, with the comments about communion occurring at the 50:45 mark. Later in this interview (at the 1:13:40 mark), Rosenthal describes the Republicans in the Texas Legislature (who are now his colleagues) as being “seriously f—ed up.” So much for civility in politics, eh? While law enforcement, like any profession, has bad actors among their ranks, true incidents of police brutality, excessive force, or unjustified killings are extraordinarily rare. Those very few law enforcement officers who abuse their power should be held accountable for their actions. 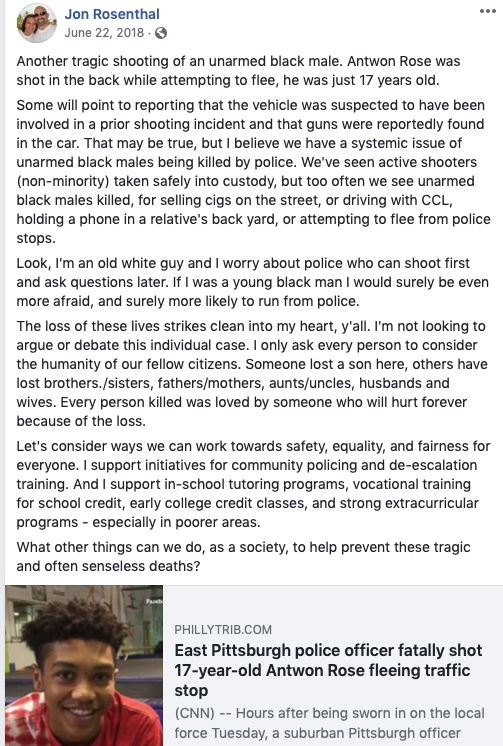 It is fundamentally unfair to the vast majority of law enforcement officers, who put their lives on the line every day to protect and serve our community, to make the generalizations about police that Rosenthal has. Comments like this are irresponsible and not only make the already stressful jobs of law enforcement officers more difficult and dangerous, but ultimately jeopardize the safety of our community as well. Based on his background and the rhetoric he used during his campaign, it comes as no surprise that Rep. Rosenthal has begun his term in office by reinforcing his radical-left credentials and showing his devotion to his extremist base. 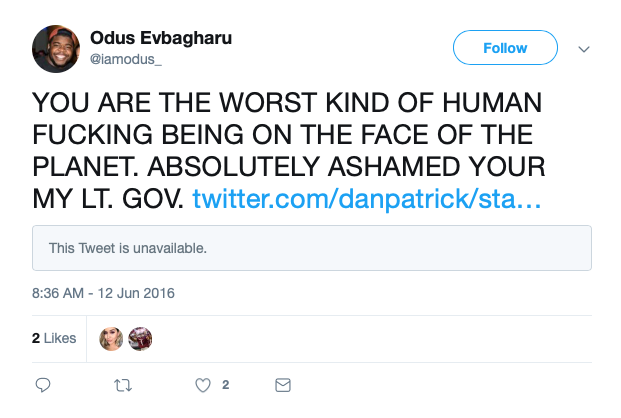 One such example is Rosenthal’s decision to hire Odus Evbagharu, who had previously served as Communications Director of the Harris County Democratic Party, as his Chief of Staff. I believe that the majority of voters in District 135 reject the angry and mean-spirited brand of politics exemplified by Representative Rosenthal’s comments, as well as those of his hired staff. I also believe that the voters in District 135 want responsible public policy that will keep Texas prosperous, not Bernie Sanders style socialism or other far-left policies that jeopardize the safety of our community and that grow government, our tax burden, and dependence on government. This is why I am running for State Representative. While the primary is more than a year away, I am starting now because the work to take back this district must begin now. The path to victory is going to be paved with conversations with voters, listening to their concerns, and effectively communicating how Republicans are best equipped to tackle the public policy issues facing our state. During the course of the campaign, I will roll out a comprehensive policy agenda regarding the issues facing Texas and District 135. District 135 deserves a Representative that will treat all everybody with respect, even in disagreement. We deserve a Representative that appreciates the sacrifices made by our law enforcement and other first responders and will stand by them, not demonize them and make their jobs even harder. We deserve a Representative that will fight for the low taxes, quality public schools, and a fair regulatory environment that makes Texas such a great place to live and work. And we deserve a Representative that believes that the power of individual liberty, not big government, is the way to prosperity. I hope to be that Representative. I look forward to having these conversations and working with other Republicans across Harris County and Texas as we work towards victory in 2020. Hi Mark, I am sure your article is great, but, with all due respect it is long and I don’t have time to read it. Time is precious for so many. Can you give us the bullet point version and put on social media? Tell us about you, what you have accomplished and why you want the job and what your issues are. Thank you so much! Melissa, thanks for the comment. I appreciate any feedback that helps me improve as a candidate. 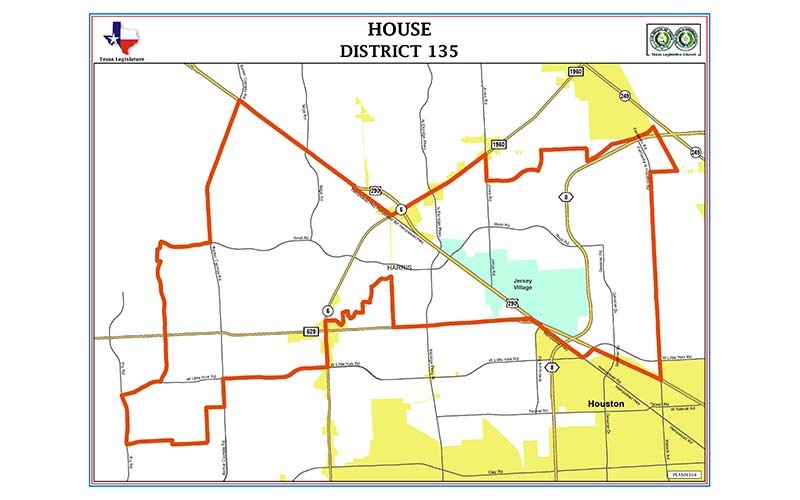 In short, I’m running for State Rep. for District 135 (Jersey Village, Cy-Fair, and Copperfield area) because our district deserves principled conservative leadership that is respectful to all, even in areas of disagreement. Our current Representative, Democrat Jon Rosenthal, has mocked Christianity, denigrated law enforcement officers, and used vulgar language to describe the Republicans in the Texas legislature who are now his colleagues. He has hired staff that engage in similarly toxic behavior. I’m a Republican precinct chair (precinct 687) and a longtime grassroots activist. I believe in a positive conservative message of small government, low taxes, and individual liberty. If elected, I’ll strive to work with others on issues where we agree, and be civil and respectful when we don’t. And I certainly won’t insult my constituents. Mark: Good analysis and very informative. I had time to read it. It took about 3 minutes but, I am an “Evelyn Woods” graduate. It didn’t take that long to get the point. You might provide a “take away” analysis for those that are too hurried. Apparently, one reader skipped to your last paragraph to decide you were running for the position. If that is your intention, you should have made it clear. In my speed reading I didn’t catch who “we” was. 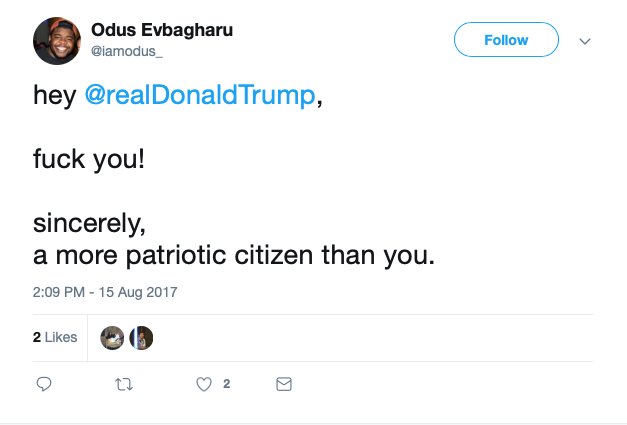 I am sure that you will find a significant number of voters who think favorably of your self-righteous BS. It all depends on the demographics of HD 135. If the district is heavily populated by Democrats and Rosenthal is his party’s candidate, he will be reelected. The best that can be hoped for is that Rosenthal will lose to an opponent in the primary, and then a less radical Democrat will be elected. Mark, you’ve got my vote, but I don’t live in HD135. If that district is heavily populated with Democrats, I suggest you save your money and that of those who might contribute to your campaign.